Pipes are often described as the arteries of a facility. They bring a wide range of things to places throughout the building for use. 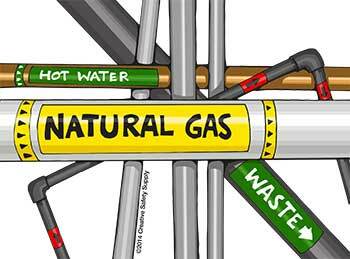 There are dozens, if not hundreds, of different types of liquids, gases, and other things that can travel through a pipe, and many of them can be quite dangerous. Being able to tell what is in a pipe with just a glance is very important not only to the efficiency of the people working on them, but also for the safety of the facility. 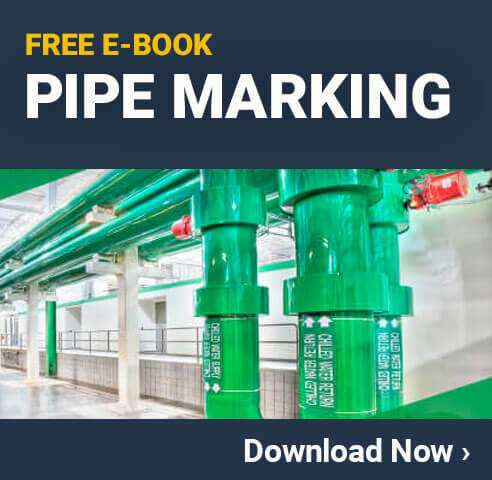 Almost all facilities operating in America (and many around the world) follow the ANSI color codes for pipe marking to help ensure everyone is aware of any hazards that might be present within a pipe. While ANSI is not a government agency, and it doesn't have any legal authority to enforce their standards, companies choose to follow them because it is well known that these standards improve safety quite significantly. When following the ANSI A13.1 standards, the most important thing is to understand the six most common color schemes. These colors will be used on almost all pipes, and making sure that everyone in the facility can immediately recognize them and what they mean will improve safety significantly. Any pipe that contains compressed air should be labeled with white text over a blue background. Compressed air is commonly used for cleaning, pressure (for many tools), and other functions. While it is an important part of many facilities, it can also be quite hazardous. Some compressed air can actually puncture the skin if someone put his or her hand in front of the nozzle thinking that it was going to be water. This type of blue and white label will minimize that risk. Pipes that contain water that is not intended for a fire suppression system should be labeled using a green label with white text. This could be water used for drinking, cleaning, a cooling system, or just about anything else. As long as it is not being directed into a fire suppression system, this is the right type of label for water. Pipes that are labeled with white text on a brown background will contain combustible fluids. People often confuse combustible and flammable since they have a similar meaning. Combustible fluids have a higher flashpoint (over 100 degrees Fahrenheit) than flammable fluids. Just because they are not quite as likely to burn, however, does not mean danger is not present. Using this type of label will help ensure people are aware of the risks so they can take proper precautions. Fluids deemed flammable will need to travel through a pipe labeled with black text on a yellow background. This includes any fluid that could ignite when exposed to heat sources, flames, sparks, or other igniters. A fluid is considered flammable when the flashpoint is at or below 100 degrees Fahrenheit.Having a properly labeled pipe is extremely important for flammable fluids because of the high risk. It will also let firemen know they need to keep flames and heat away from these pipes if at all possible. Toxic and/or corrosive fluids present very serious hazards. These types of fluids, however, can also be used for many different tasks. To help ensure everyone is as safe as possible, applying a label that has an orange background behind black text is very helpful. Pipes used to transport fluids that can quench fires should be labeled with white text over a red background. There are many examples of this type of fluid. A common one is fluid that feeds into a fire suppression system. 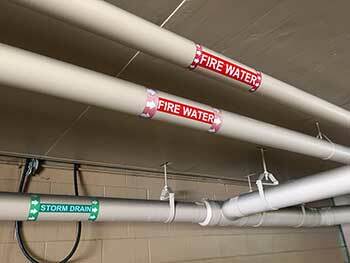 The water (or other fire suppression fluid) pipes that go to the sprinklers should have this type of label. It is important to note that this color scheme is only for fire suppression uses. For example, a pipe containing water that goes to a drinking fountain would NOT have this type of label on it. This is because firemen and other emergency responders need to be able to quickly identify pipes that supply the fire suppression systems. While ANSI has set the above color codes aside for specific purposes, it has also reserved several color combinations for user-defined labeling. Each facility can choose what to use these color combinations for (if anything). The most important thing to remember when using custom colors is that it should have the same meaning throughout the company. What Goes on the Pipe Labels? In addition to having the right colors on the pipes, it is also important to have the right text and symbols on the labels. Most facilities tend to keep pipe label contents fairly basic. Attempting to use an excessive amount of wording will make it impossible to read from any distance, which makes it essentially useless. Adding arrows to indicate flow direction is very helpful. Large words like "WARNING" or "FLAMMABLE" can also be used in these situations. Evaluating how to convey the needed message quickly and clearly to people in the area will help ensure the pipe labels improve safety as much as possible. In addition to following the ANSI color code standards, a facility also needs to make every effort to ensure the labels are visible. Since pipes can be located anywhere in the facility from under the floor to high up in the rafters, proper placement of the labels is very important. The standard rule of thumb is to make sure the text is positioned in such a way that it will be immediately visible to people looking at it from the most likely direction. Pipes that travel up through the rafters should have the labels positioned so the text is at an angle pointing down toward the ground. This way people on the floor can read them, as well as people who are up on a rafter working on the pipes themselves. Multiple Labels - Using labels every 50 or fewer feet will make sure people can follow the pipe along and always be aware of what is inside it. Near Obstructions - When the pipe has a valve, flange, or other obstruction to visibility, a label should be applied on either side. This will help ensure the obstruction does not make it so people in the area can't see the label. Through Walls - Pipes often travel through walls. When this is the case, a pipe label should be applied to the pipe on either side of the wall so that everyone will be able to see it. Perhaps most important is that anyone using pipe markings should also apply common sense. If there are certain areas illuminated by lights and others that are dark, putting the labels in the light just makes sense. Rather than just slapping a label on every set amount of distance, the team working on this project should take the time to really think about the visibility of the labels and how it will be seen from different areas within the facility. When attempting to begin the process of labeling pipes according to the ANSI color codes, facilities will need to decide where their pipe labels will come from. There are two main options available. Some companies choose to buy the labels they need pre-printed, and others choose to print the labels themselves with an industrial label printer. 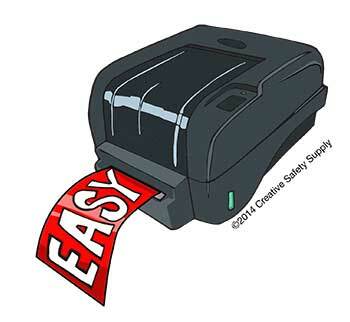 While both can be effective, having an industrial label printer onsite in the facility comes with many additional benefits. In addition, on a price per label basis, it will actually be cheaper to have them printed in the facility rather than ordering them from another company. Of course, there is a somewhat higher up front cost if the facility doesn't already have a good quality label printer. Once a facility reaches a certain size, the only real option is to print custom labels right on site. This will make it possible to ensure new labels can be made whenever the old ones begin to wear out, are damaged, or when new pipes are being installed. The printer can also be used in many other areas of the facility, which makes its return on investment even greater.